Q: If I receive a traffic infraction in the Village of Homer, what do I need to do? A: The first step is to mail your plea into the Court at 4 Water Street Homer, NY 13077. Section A is a Guilty Plea. If you make a guilty plea, the Judge will simply set your fine and send your notification through the mail of that fine and the New York State Mandated Surcharge if there is one. You will be given 30 days to pay. Section B is a Not Guilty Plea. If you make a Not Guilty Plea, you will be mailed instructions to write to the Assistant District Attorney for a pre-trial conference and given an adjournment to do so. You will need to send our ADA a copy of your ticket, a letter of explanation, a copy of your driver abstract (obtained at the DMV for a $10 fee) and a self-addressed and stamped envelope. If any accident occurred, include a copy of the accident report together with a letter from your insurance company stating its intentions regarding any claims or potential claims. The ADA will write back to you, possibly with an offer. If you accept the offer, sign that letter and mail it back to the Court by the adjournment date given to you by the Court. If you do not accept the offer given, you would need to request a trial from the Court. If you are charged with a misdemeanor level crime or higher, you will need to appear on the date the officer provided for arraignment. A plea through the mail cannot be accepted. 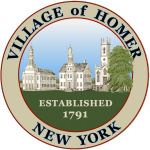 Q: Do dogs in the Village of Homer need to be licensed? A: Dogs are required to be licensed and are not permitted to roam freely through the Village. Dog licenses can be purchased at the Town Clerk’s Office 31 N. Main Street. When walking your dog throughout the Village, please be sure the dog is leashed and that you clean up after your dog. Q: Does the Village of Homer have a curfew? A: Yes it does. No child under the age of sixteen (16) years shall be in or upon any of the streets, sidewalks, parks or public places in the Village after the hour of 10:00pm on Sunday – Thursday or after the hour of midnight on Friday – Saturday, unless the child is accompanied by an adult, conducting emergency business or legitimate business directed by a parent, or for employment purposes.